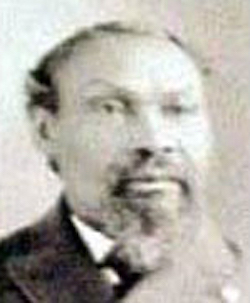 William P. Stewart, a Civil War veteran, was also an early black settler in Snohomish County, Washington. Stewart was born on December 9, 1839, as a free person of color to Walden and Henrietta Stewart in Sangamon County, Illinois. He had five other siblings, four brothers and one sister, and was living in Forest, Wisconsin, in 1860. When the Civil War broke out in 1861, President Abraham Lincoln resisted the idea of African Americans serving in the military. By 1862, however, he was convinced that in order to militarily weaken the Confederacy, slavery had to be abolished in those states of rebellion (Emancipation Proclamation) and that the recruitment of black men into the Union Army was necessary. When the recruitment drive reached Illinois, William P. Stewart enlisted into the 29th U.S. Colored Infantry Regiment on February 1, 1865, at the age of twenty-five. The almost 5’6" farmer served for less than a year in the Union Army fighting for the unity of the nation and the freedom for nearly four million enslaved blacks. In the last few months of the war, Stewart and his comrades fought near Petersburg and in the Appomattox Campaign in Virginia. Stewart, however, suffered severe diarrhea in the trenches in Petersburg, which excused him from active duty. Instead, he served as a mess cook assistant. In May 1865, the regiment was sent to a final assignment in Texas along the Rio Grande River as part of the XXV Corps, an all-black unit stationed along the border with Mexico to challenge French control of that nation. Some black soldiers actually crossed the Rio Grande to fight with troops loyal to Mexican President Benito Juarez. While in Texas, Stewart contracted rheumatism, a fate many soldiers experienced. In November 1865, the 29th Infantry disbanded. Stewart moved back to Wisconsin and married Elizabeth “Eliza” Thornton on October 25, 1868, in Logansville. The couple had one son, Vay, a year later in 1869. Stewart lived and worked as a lumber laborer in Peshtigo, Wisconsin, until he and his family relocated to the community of Snohomish in Washington State in 1899. According to Stewart’s obituary, he purchased a farm one mile east of the city and became a well-respected citizen. He also became a member of the Grand Army of the Republic (GAR), a national fraternal organization comprised of veterans of the Union Army, Union Navy, and Marines who served in the Civil War. For the rest of his life, Stewart suffered debilitating bouts of stomach illness and rheumatism due to the time he served in the military. He died from a stomach-related illness on December 11, 1907, at his home. At the time of his death, he was receiving $8 per month from the government’s disability pension. His wife, now a veteran’s widow, received $40 per month from the government until she passed in 1929. Stewart is buried in the Grand Army of the Republic Cemetery in Snohomish, Washington. 1880 United States Federal Census, Peshtigo, Marinette County, Wisconsin, Ancestry.com assessed on Feb. 20, 2016; 1900 United States Federal Census, Shorts, Snohomish County, Washington, Ancestry.com assessed on Feb. 20, 2016; Civil War Veterans Buried in WA State, “William P. Stewart,” http://www.civilwarvetswastate.com/find-a-veteran?sobi2Task=sobi2Details&sobi2Id=284, accessed online Feb. 22, 2016; Find A Grave, “Pvt. William P. Stewart,” http://www.findagrave.com/cgi-bin/fg.cgi?page=gr&amp;GRid=13813712; Washington (State). Legislature. Assembly. Requesting that the State Route Number 99 Be Named the “William P. Stewart Memorial Highway.” A (SJM8014). 2015-2016 Reg. Sess. (February 12, 2016). Washington State Assembly. Web. 22 Feb. 2016; National Archives and Records Administration. U.S., Civil War Pension Index: General Index to Pension Files, 1861-1934, Ancestry.com.